This is a cross between a tea bread and a malt loaf. So it could be called tea loaf or even malt bread? You decide. Anyway, what ever you want to call it, it tastes lovely. So simple, kids can cook! If possible, pre-soak the mixed fruits in the tea over night or even for a few hours before you make the recipe. This stops the fruit sinking to the bottom of the cake when it cooks. If you forget or haven’t got time, it will be fine left to soak for as many minutes spare that you have. Makes 2 loaves. Make up the tea using 1 teabag in boiling water & leave the teabag to stew for a few minutes until it looks quite strong. Then get rid of the teabag. Add all of the mixed fruit into the jug of tea & give it all a good stir to make sure all of the fruit is covered in the tea. Leave for as long as you can to let the fruit absorb the tea. This makes the fruits go all plump, juicey & full. The longer you leave them, the plumper they’ll be. If you don’t soak them they’ll just be a little bit sadder and sink to the bottom of the cake when its cooked. Pour the pre-soaked tea & fruit into a mixing bowl. Add the treacle, malt extract & sugar & give it a really good mix. Next add the eggs. The mixture will seem a bit frothy and bubbly now. Tip in the flour, baking powder and bicarbonate of soda and mix everything together really well. it’s looks a bit revolting but don’t worry, it’s meant to look like that. It should smell nice though. Line 2 loaf tins with baking paper. Split the mixture equally between the 2 loaf tins. Then bake at gas mark 2 / 150C for 1 hour 10 minutes. It should be firm to the touch & a skewer should come out clean when inserted into the middle of the cake. Remove from the oven, but before you remove the baking paper, heat the syrup for 10-15 seconds in the microwave and brush over the loaf. Don’t let it cool too much though before you cut yourself a slice and sit down with a nice cup of coffee and a slice of the malt loaf. If you want to, you can even butter a piece before you eat it. 1 of the loaves can be eaten & the other frozen. 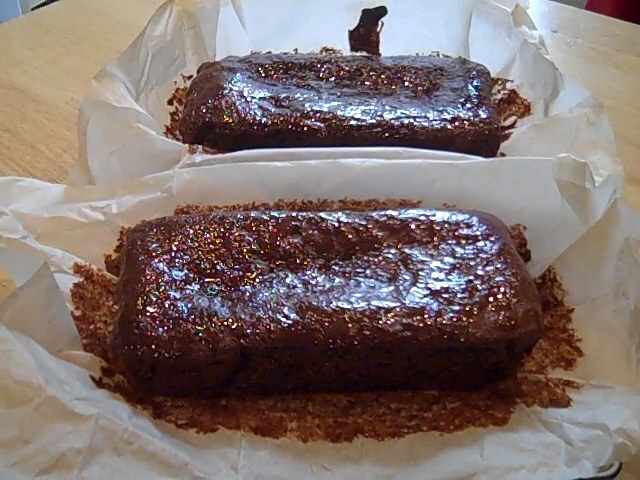 Simply wrap it in baking parchment & then kitchen foil & freeze for up to 4 months.